Slater. Original तस्वीरें belong to Universal Pictures, आइकनों द्वारा DarkSarcasm.. 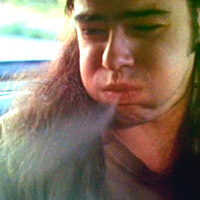 Images in the Dazed and Confused club tagged: dazed and confused image icon ron slater rory cochrane. This Dazed and Confused icon might contain फर कोट, फर कॉलर, फर लहजे, फर उच्चारण, फर एक्सेंट, चित्र, headshot, closeup, हेडशॉट, and क्लोज़अप.